One of Mexico's most remarkable women was a nun who lived in the 17th century. 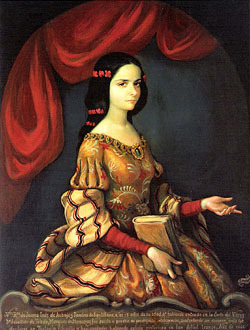 Sor Juana Ines de la Cruz was an outstanding writer and poet whose works were extremely controversial for their time. Considered to be Mexico's first feminist, Juana Ines de la Cruz was an extraordinary woman. Today her image graces the 200-peso note, a testimony to her achievements and place in history. Although Juana demonstrated unusual abilities from a young age, her beginnings wouldn't initially suggest great potential. Born in the year 1651 (with some reports advising 1648) to an unwed mother, Juana grew up in the shadow of the Popocatepetl volcano, to a poor but educated family during Mexico's colonial period. Juana was known to be an intellectually precocious child. It is widely documented that she knew how to read by three years of age. Her quest for learning was seemingly unquenchable. Legend advises that as a young girl, Juana sought out her Grandfather's library and read its entire 3,000 volumes. Juana's scholarly pursuits included the study of poetry and learning to speak Latin fluently. She reportedly mastered the language after receiving just 20 lessons. If being a child prodigy wasn't enough, Juana was also known for her amazing beauty. At a young age, Juana left home to live with her aunt in Mexico City. Her presence and abilities did not go unnoticed. She soon became a favorite at the Royal Court where she would impress visitors with her wit and scope of knowledge. Given her many gifts, both intellectual and physical, one might assume that Juana soon married. However, to the apparent surprise of many, Juana chose instead the monastic life. Some reports suggest a failed love affair may have led to Juana's decision. However, Juana, apparently when asked about her choice, replied that life in a convent was her only option, as the environment provided the necessary atmosphere in which she could continue her studies. Once safely ensconced in the walls of the convent, Juana fully immersed herself in the disciplines of theology, science, history, music and literature. In addition to her studies, Juana also corresponded with the leading poets and scholars of the day. Inspired, Juana began to write her own poetry. She proved to be no ordinary scribe, indeed her works proved to be both brilliant and highly controversial. Juana wrote several pieces that were revolutionary, especially for the time period in which she found herself in. Juana didn't limit her writings to topics related to religious matters. On the contrary, many of her works were love poems and plays of passion. This was quite unusual for a woman altogether but for a nun, her choice of subject matter aroused the wrath of many who were in power. As well, Juana was known to comment on matters theological, which in turn, incited those in authority to condemn her audacity. Women in Colonial Mexico were not culturally supported to express their own opinions. It wasn't long before her words and her personage incited an angry response. One of Juana's famous literary pieces entitled 'Hombres Necios' (Foolish Men) is a classic work. Within its scope it addresses the inherent rights of all women and the hypocrisy of those who judge others, namely in regards to prostitution. Juana sheds light on the matter by poising the question of who is more to blame, the one who commits the act for money or the one who pays for it. Another hallmark work of Juana's is a letter she wrote in response to a critique. This famous letter, 'Respuesta a Sor Filotea' (Response to Sister Filotea) was prompted by an angry letter she received where a supposed colleague criticized her secular leanings, admonished her to abandon her writings and commit herself solely to religion. In truth, the author was the Bishop of Puebla who disguised his true identity. This bishop was a supposed friend of Juana's and thus the betrayal was double. Not surprisingly, the reaction to Juana's letter from the church was not positive. They sought to humiliate her by publishing her letter and openly criticizing her position. Shortly thereafter, Juana did abandon her writings and retreated from public discourse. She died a few years later in 1695 after caring for nuns in her convent who were stricken with the plague. Today, Sor Juana continues to be studied and her prolific writings continue to inspire others as witnessed by the late Nobel Prize winner Octavio Paz' book on Sor Juana's life, 'Sor Juana Or, the Traps of Faith'. Each year in Mexico a festival is held in her honor that is sponsored by the National Museum of Mexican Art. There is also a corresponding achievement award which celebrates women of Mexican descent who have made noteworthy accomplishments in the arts and cultural disciplines.